Barriers shouldn’t get in the way of people from all ability levels experiencing the great outdoors. People of all ability levels should be empowered to access nature. That’s why we work with community partners to address access barriers for people with disabilities around the state. In 2016, we partnered with Adaptive Sports Northwest to provide a hand-cycling program around a race track in North Portland. 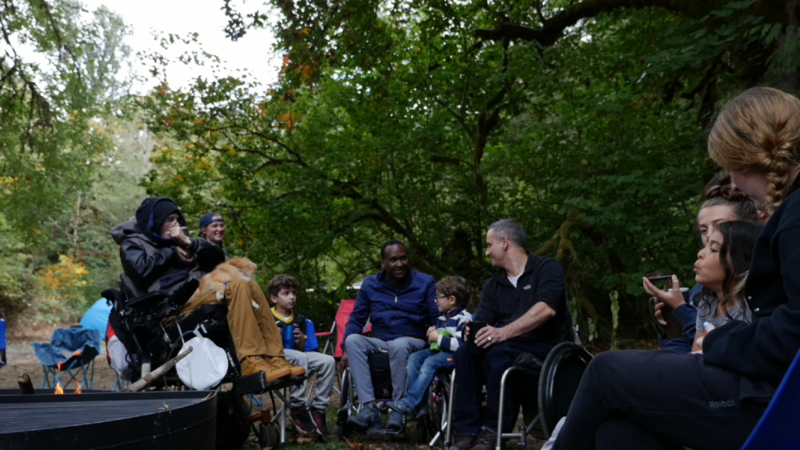 And in 2018, we helped facilitate a collaborative that included Oregon Parks & Recreation, Adventures Without Limits, and Oregon Spinal Cord Injury Connection to put together a camping weekend for Oregonians in wheelchairs, along with their partners and families. For people with mobility disabilities, infrastructure is often a barrier to accessing the outdoors, from inaccessible curbs on sidewalks all the way to inaccessible restroom options in public spaces. These and other barriers can discourage people with mobility impairments from going outside, and the health disparities that face people with disabilities often go unrecognized or unaddressed. Through our work with other community based organizations and adaptive outfitters, we’re working to make Oregon more accessible, welcoming, and inclusive for people with all ability levels.